Accuweather.com recently released reports warning of a major shift in weather patterns that will continually affect Maryland residents throughout the remainder of 2013. SI Restoration, a leading expert in water and flood damages, offers Maryland property owners a variety of safety tips for impending rains and flooding. 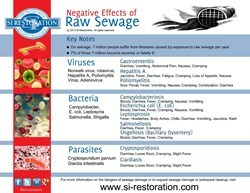 SI Restoration divulges the ill effects of raw sewage exposure with latest infographic. Headquartered in Baltimore, SI Restoration urges Maryland residents to take this shift in weather pattern seriously by preparing precautionary practices that will combat flood and water damage. According to Alex Sosnowski’s report on accuweather.com, shifting weather patterns will produce record high temperatures in Maryland and its surrounding states throughout the remainder of 2013 and into the beginning of 2014. Coupled with strong storms forecasted to bring “soaking rain” to the Old Line State, home and business owners are likely to experience severe flooding that can cause thousands of dollars in damages. Maryland flood damage experts SI Restoration have been providing expert service and advice to residents since 1989. Headquartered in Baltimore, SI Restoration urges Maryland residents to take this shift in weather pattern seriously by preparing precautionary practices that will combat flood and water damage. SI Restoration calls property owners to action with a recently published info graphic regarding one of the biggest dangers due to flood damage: exposure to raw sewage. This informational guide offers key notes on how severe illnesses due to raw sewage exposure can affect Maryland residents while identifying three key dangers. Viruses, bacteria, and parasites all thrive in raw sewage and other types of tainted flood waters. Diseases and illnesses like Hepatitis A, E. coli, Salmonellosis, Bacillary Dysentery, and Giardiasis can all be contracted after exposure to flood waters. SI Restoration estimates that upwards of 140,000 Maryland residents develop symptoms due to raw sewage exposure per year. While viral and bacterial threats may be the most harmful result of property flooding, mold growth must be considered as well. SI Restoration warns that mold remediation will be needed if affected flood areas are not dried within 48 hours. Mold growth is fueled by moisture. While mold sickness is a hotly-debated topic in the restoration industry, damage to property due to mold growth can be extremely costly for home and business owners. For more than 22 years, SI Restoration has provided water damage, fire restoration, mold remediation / removal, hoarding cleanup, flood restoration repair, smoke damage and other restoration services. The company services commercial, industrial and residential customers with an IICRC certified staff. To learn more about SI Restoration, please visit http://www.si-restoration.com.